Jenni Grout Amazes the Arab Music World! Just a few months earlier that same young woman was recording her first studio single with us here at Thread. Her name is Jenni Grout and little did we know that she would soon fly half way across the world to become one of the biggest stars in Arab music. The cool thing is that she did it by playing authentic Arab music without the influence of western pop music production. That fact was also very ironic because the stage on which she became famous was filled with native Arabic musicians who were emulating western pop music. Jenni Grout who is classically trained found her true voice in Arabic music after travelling through Europe and Northern Africa. 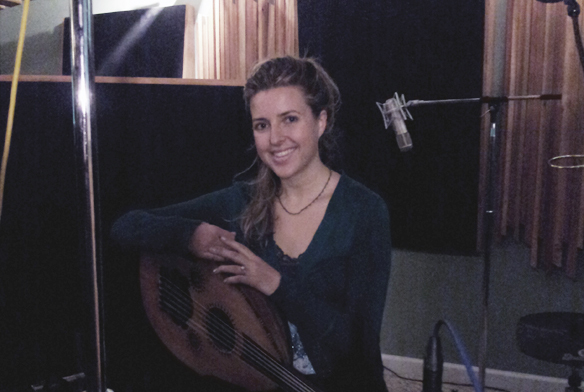 She returned to America with her oud (an Arabic version of the Lute) and completed two tracks with David McConnell before she flew to Beirut to perform on “Arab’s Got Talent” (the biggest “American Idol” type show in all of the Arabic speaking world). Not only did she make it to the first round but Jenni also went on to win the second and third rounds before finishing as a finalist in grand fashion in that shows season finale. Critics were hard on her at first because she doesn’t speak Arabic (only sings it) but soon everyone was won over by her passion and beautiful voice. Soon they were referring to her as the best ambassador America could have sent.